In a small bowl, whisk tahini, lemon juice, water, oil, salt and pepper. Add in nutritional yeast and garlic. Add more water as needed 1 tbsp at a time until you have desired consistency. It should be on the thicker side but not so thick that you can’t pour it on the salad. Taste for salt, pepper and garlic and add more as desired. Toss in the carrots, red pepper and sunflower seeds and coat. Add more dressing if desired and serve. Refrigerate extra dressing and use the next day for another delicious salad. 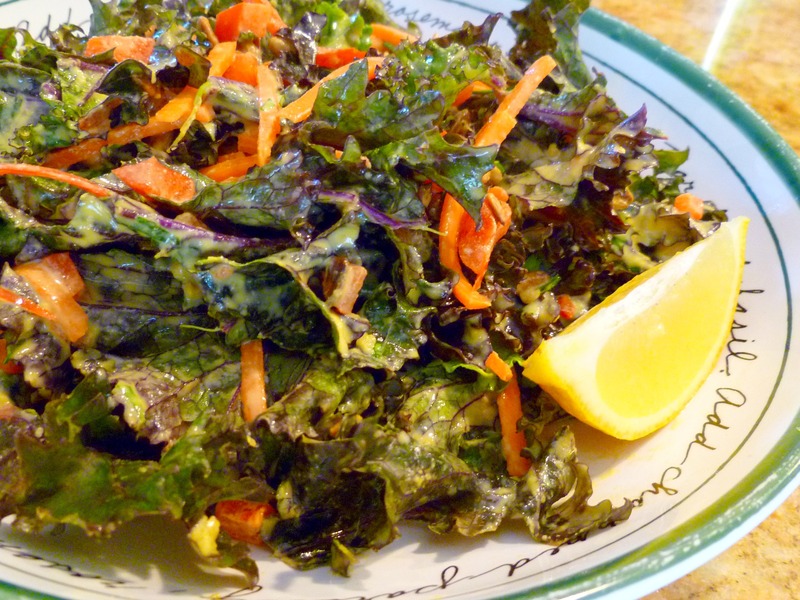 Footnotes: Kale is a stiff so if you don’t finish eating all the salad, this is one of the only varieties of “lettuce” that will keep overnight in the refrigerator, with dressing on it, and not be soggy the next day. It’s always better fresh, but if you must, you can refrigerate and eat later for a healthy midnight snack. I want this salad! I just put nutritional yeast on my shopping list, a lighter lemon-tahini dressing sounds like just what my summer needs. It’s tasty and easy. Experiment with the dressing ratios. The next day it will thicken so you may need to add more water but the flavor is vibrant enough it won’t water it down. Super easy stuff! I’m always looking for new ways to serve raw kale, and we just happen to have a huge jar of tahini. Trying this soon! 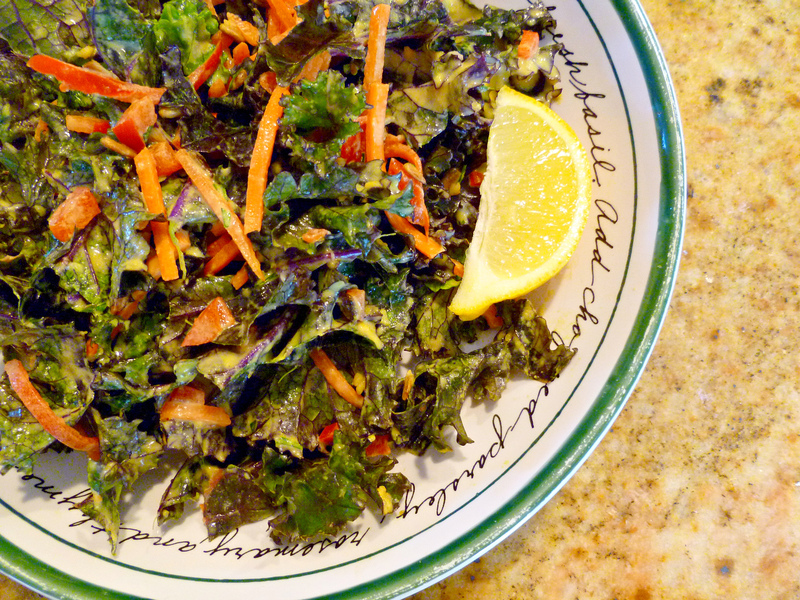 My favorite is still my tahini-garlic Kale Salad that you can find here https://voguevegetarian.com/2011/11/04/tahini-garlic-kale-salad/ You might want to give this one a try too if you have tons of tahini. Enjoy! Excellent, thank you! Do you think sesame seeds would be a good alternative to sunflower seeds? My husband is allergic to sunflower. Lauren, yes, I think sesame seeds would work just fine. Sunflower seeds give it a nice texture and light nutty flavor but since tahini is ground up sesame seeds, the sesame should be a nice substitute. Let me know what you think. This looks so good!!! A lot of times when I want to make something new I read yours and others recipes, just for a place to start. Sometimes I will just use the ideas and make variations of my own, but this is one I think I would make exactly as is. You have had several that are like that for me. Good job, my dear! Oh, wow! I think you’ll like it. If you save the dressing overnight, it will be a little thicker so you may need to add a little more water. Salads like this sometimes are better if you just get in with your hands and massage it into the leaves a bit. Enjoy!